It should be noted that, with the exception of the first sentence of the final colophon, all the above references to Thomas Malory as a knight are, grammatically speaking, in the third person singular, which leaves open the possibility that they were added by a copyist, either in Caxton's workshop or elsewhere. However, scholarly consensus, as has been previously mentioned in this article, is that these references to knighthood refer to a real person and that that person is the author of Le Morte d'Arthur. Christ Church Greyfriars, known as Christ Church Newgate Street, was a church in Newgate Street, opposite St Pauls Cathedral in the City of London. Established as a church in the thirteenth century, it became a parish church after the dissolution of the monastery. 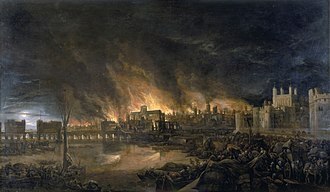 Following its destruction in the Great Fire of London of 1666, except for the tower, the church was largely destroyed by bombing during the Second World War. The ruins are now a public garden, Christ Church Greyfriars had its origins in the conventual church of a Franciscan monastery, the name Greyfriars being a reference to the grey habits worn by Franciscan monks. 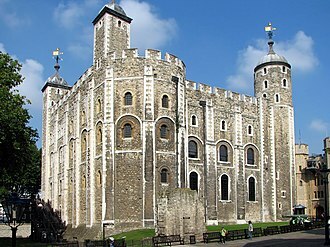 It was built partly at the expense of Marguerite of France and she was buried at the church, as was Isabella, widow of Edward II. The heart of Eleanor of Provence, wife of Henry III, was interred there. 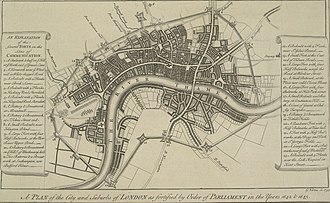 Richard Whittington, Lord Mayor of London founded a library in connection with the church in 1429, the monastery was dissolved in 1538 during the English Reformation. 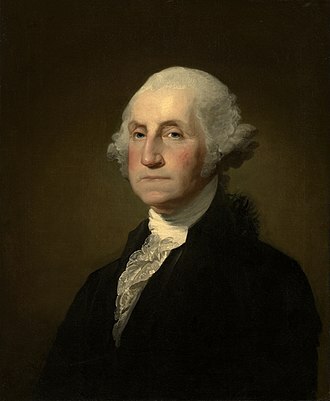 The building and fittings suffered heavy damage in this period, tombs disappeared, sold for their marble and other valuable materials, monuments were defaced. 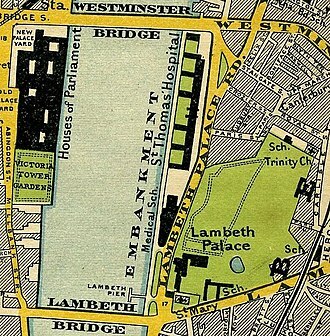 In 1546 Henry VIII gave the priory and its church, along with the churches of St Nicholas Shambles and St Ewin, Newgate Market, a new parish of Christ Church was created, incorporating those of St Nicholas and St Ewin, and part of that of St Sepulchre. 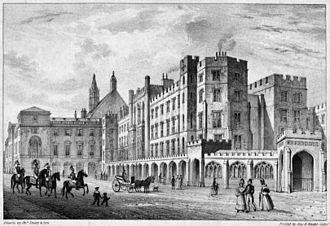 The priory buildings housed Christs Hospital school, founded by Edward VI, the medieval church was destroyed by the Great Fire of London in 1666. Reconstruction was assigned to Wren, who oversaw a decades long-programme that rebuilt St. Pauls Cathedral, there appears to have been some debate about the form the new Christ Church should take. A surviving unused design shows a structure larger than what was eventually built. The parish was united with that of St Leonard, Foster Lane, to save time and money, the foundations of the gothic church were partially reused. The new church and tower were completed in 1687, at a total cost of £11,778 9s. Smaller than the structure, the building measured 114 feet long and 81 feet wide, occupying only the eastern end of the site of the medieval church. It has become an influential romance and tragedy, retold in numerous sources with many variations. 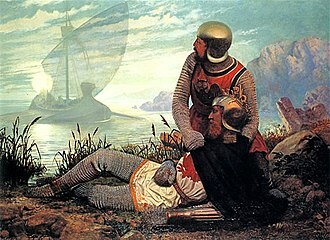 The tragic story is of the love between the Cornish knight Tristan and the Irish princess Iseult. While the details of the story differ from one author to another, there are two main traditions of the Tristan legend. The early tradition comprised the French romances of two poets from the half of the twelfth century, Thomas of Britain and Béroul. Later traditions come from the Prose Tristan, which was different from the earlier tales written by Thomas. 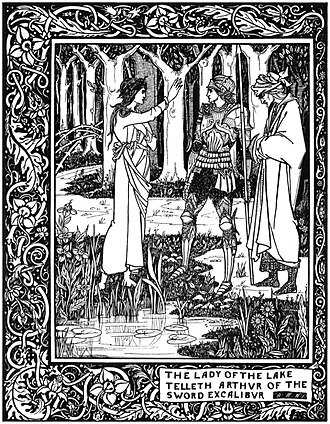 The Prose Tristan became the medieval tale of Tristan and Iseult that would provide the background for the writings of Sir Thomas Malory, the English author. The story and character of Tristan vary from poet to poet, even the spelling of his name varies a great deal, although Tristan is the most popular spelling. Most versions of the Tristan story follow the general outline. After defeating the Irish knight Morholt, Tristan goes to Ireland to bring back the fair Iseult for his uncle, King Mark of Cornwall, along the way, they ingest a love potion which causes the pair to fall madly in love. In the courtly version, the effects last a lifetime, in the common versions. In some versions, they ingest the potion accidentally, in others, the potions maker instructs Iseult to share it with Mark, although Iseult marries Mark and Tristan are forced by the potion to seek one another as lovers. While the typical noble Arthurian character would be shamed by such an act, the kings advisors repeatedly endeavour to have the pair tried for adultery, but the couple continually use trickery to preserve their façade of innocence. 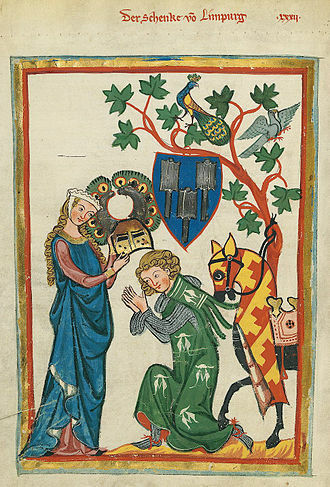 In Bérouls version, the love potion eventually wears off, as with the Arthur-Lancelot-Guinevere love triangle, King Mark, and Iseult all hold love for each other. Tristan honors and loves King Mark as his mentor and adopted father, Iseult is grateful that Mark is kind to her, but every night, each has horrible dreams about the future. Tristans uncle eventually learns of the affair and seeks to entrap his nephew, present is the endangerment of a fragile kingdom, the cessation of war between Ireland and Cornwall. Le Morte dArthur is a reworking of traditional tales by Sir Thomas Malory about the legendary King Arthur, Lancelot and the Knights of the Round Table. Malory interprets existing French and English stories about these figures and adds original material, Le Morte dArthur was first published in 1485 by William Caxton, and is today perhaps one of the best-known works of Arthurian literature in English. 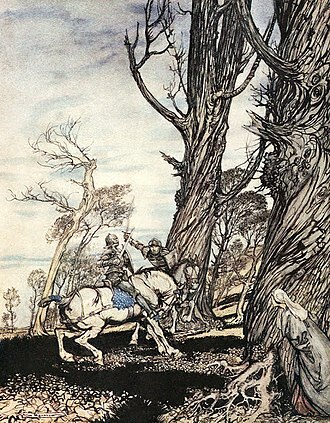 Many modern Arthurian writers have used Malory as their source, including T. H. White in his popular The Once and Future King. 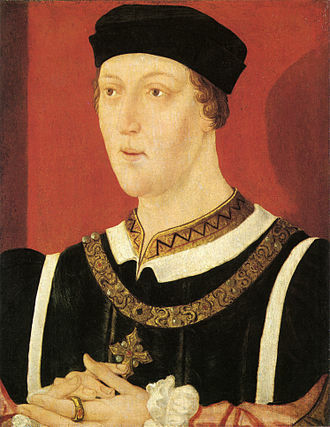 Sir Thomas inherited the estate in 1434 after his father died and is believed to have engaged in a life of crime punctuated with long periods of imprisonment. 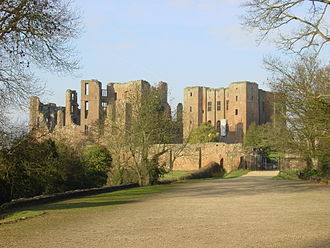 Although in 1450 he was a member of Parliament and he was imprisoned in Coleshill but escaped and soon after robbed the Cistercian monastery. 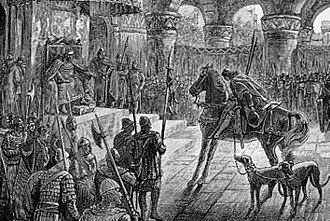 Malory was once arrested in 1454, but two years he was released through a royal pardon. 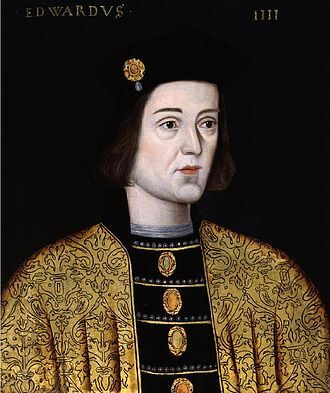 His exact date of birth and early years are obscure, and his name does not enter clear historical record until 1439, Sir Thomas Malory died in prison on 14 March 1471, with Le Morte dArthur published posthumously by William Caxton on 31 July 1485. He called the full work The hoole booke of kyng Arthur & of his noble knyghtes of the rounde table, modernized editions update the late Middle English spelling, update some pronouns, and repunctuate and reparagraph the text. Others furthermore update the phrasing and vocabulary to contemporary Modern English, here is an example in Middle English and in Modern English, Doo after the good and leve the evyl, and it shal brynge you to good fame and renomme. Do after the good and leave the evil, and it shall bring you to good fame, the Middle English of Le Morte DArthur is much closer to Early Modern English than the Middle English of Chaucers Canterbury Tales. If the spelling is modernized, it reads almost like Elizabethan English, the first printing of Malorys work was made by Caxton in 1485. 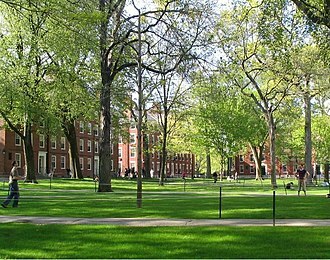 Only two copies of original printing are known to exist, in the collections of the Morgan Library & Museum. 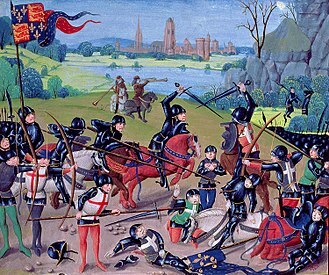 It proved popular and was reprinted in 1498 and 1529 with some additions, three more editions were published before the English Civil War, William Coplands, Thomas Easts, and William Stansbys, each of which contained additional changes and errors. Colchester /ˈkoʊltʃɛstər/ is an historic large town and the largest settlement within the borough of Colchester in the county of Essex. 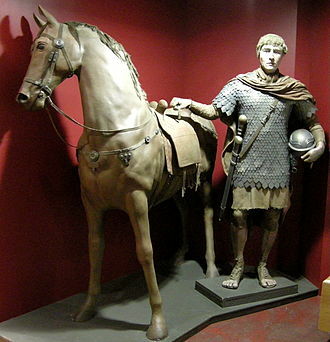 As the oldest recorded Roman town in Britain, Colchester is claimed to be the oldest town in Britain and it was for a time the capital of Roman Britain, and is a member of the Most Ancient European Towns Network. Colchester is some 50 miles northeast of London and is connected to the capital by the A12 road and it is seen as a popular town for commuters, and is less than 30 miles away from Stansted Airport and 20 miles from the passenger ferry port of Harwich. 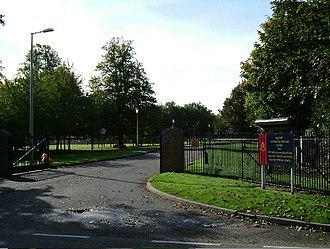 Colchester is home to Colchester Castle and Colchester United Football Club and it has a Conservative Member of Parliament, Will Quince, who was elected in the 2015 General Election. 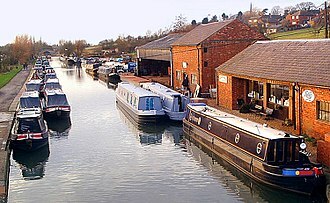 The River Colne runs through the town and it is a widely held belief that the name Colchester is derived from the Latin words Colonia and Castra, meaning fortifications. The earliest forms of the name Colchester are Colenceaster and Colneceastre from the 10th century, in this way of interpreting the name, the River Colne which runs through the town takes its name from Colonia as well. Cologne gained its name from a similar etymology, ekwall went as far as to say it has often been held that Colchester contains as first element colonia. This derivation is ruled out of court by the fact that Colne is the name of old villages situated a good many miles from Colchester. The identification of Colonia with Colchester is doubtful, from these deposits beneath the town have been found Palaeolithic flint tools, including at least six Acheulian handaxes. Further flint tools made by hunter gatherers living in the Colne Valley during the Mesolithic have been discovered and this included a pit found at Culver Street containing a ritually placed Neolithic grooved ware pot, as well as find spots containing Deverel-Rimbury bucket urns. Before the Roman conquest of Britain it was already a centre of power for Cunobelin – known to Shakespeare as Cymbeline – king of the Catuvellauni, who minted coins there. Its Celtic name, variously represented as CA, CAM, CAMV, CAMVL and CAMVLODVNO on the coins of Cunobelinus, during the 30s AD Camulodunon controlled a large swathe of Southern and Eastern Britain, with Cunobelin called King of the Britons by Roman writers. Flintshire is a county in north-east Wales, bordering the English county of Cheshire to the east, Denbighshire to the west and Wrexham County Borough to the south. It is named after the county of Flintshire which had notably different borders. 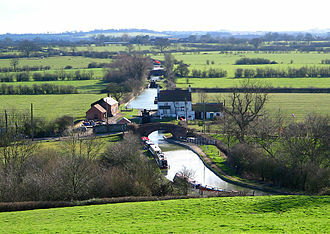 Flintshire is considered part of the Welsh Marches and formed part of the historic Earldom of Chester, the county is governed by Flintshire County Council. Flintshire takes its name from the county of Flintshire established in 1536 which existed until 1974 when it was abolished under the Local Government Act 1972. Its re-establishment in 1996 under the Local Government Act 1994 does not follow those original boundaries and silver mine workings are evident in the area, with several sows of lead found bearing the name DECEANGI inscribed in Roman epigraphy. The Deceangli appear to have surrendered to Roman rule with little resistance, following Roman Britain, and the emergence of various petty kingdoms, the region had been divided into the Hundred of Englefield, derived from the Latin Deceangli. 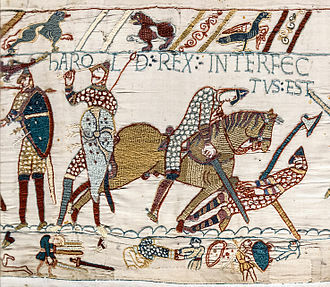 By the time of the Norman conquest in 1066 it was under the control of Edwin of Tegeingl, edwins mother is believed to have been Ethelfleda or Aldgyth, daughter of Eadwine of Mercia. Flintshire today approximately resembles the boundaries of the Hundred of Atiscross as it existed at the time of the Domesday Book. 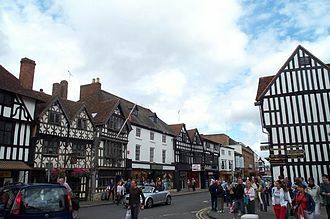 Atiscross, along with the Hundred of Exestan, was transferred from the Earldom of Chester to the expanding Kingdom of Gwynedd from the west in the 13th century following numerous military campaigns. This region, as well as a formed from part of the Hundred of Dudestan, formed the main areas of Flintshire. 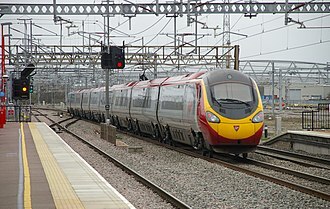 It was administered with the Palatinate of Chester and Flint by the Justiciar of Chester, the county was consolidated in 1536 by the Laws in Wales Acts 1535–1542 under the Tudor King Henry VIII, when it was incorporated into the Kingdom of England. Flintshire remained in existence until 1974 when it was merged with Denbighshire, Clwyd was abolished only 22 years and Flintshire re-established in its present form in 1996. The River Dee is a river in the United Kingdom. It flows through parts of both Wales and England, forming part of the border between the two countries, the river rises in Snowdonia, flows east via Chester and discharges to the sea in an estuary between Wales and the Wirral Peninsula in England. It has a length of 70 miles. The River Dee was the boundary of the Kingdom of Gwynedd in Wales for centuries. It was recorded in the 13th century as flumen Dubr Duiu, the total catchment area of the River Dee down to Chester Weir is 1,816.8 km2. The estimated average annual rainfall over the catchment area is 640 mm, between its source and Bala Lake the river is known by its Welsh name, Afon Dyfrdwy. Legend tells that the waters of the pass through Bala Lake. Skirting the village of Llanfor, the path of the river takes it past Llandderfel, the river trends generally east-southeast through the Vale of Edeyrnion, shadowed by the B4401 Bala to Cynwyd road. Leaving Gwynedd and entering Denbighshire the Dee flows beneath other historic bridges at Llandrillo, from here the river passes the Iron Age hillfort of Caer Drewyn and enters the Clwydian Range and Dee Valley AONB. Through its forested valley the course takes it through Carrog and Llantysilio, at Berwyn the river passes over the manmade Horseshoe Falls, before picking up speed on a downhill gradient past the Chain Bridge Hotel and its historic pedestrian bridge. First built in 1814, and refurbished by Henry Robertson in 1870, in 1928 the original bridge was destroyed by severe flooding and was rebuilt in its current form from original parts in 1929. The course of the river takes it through Llangollen and under its 16th-century. The bridge is a Scheduled Ancient Monument and considered one of the Seven Wonders of Wales, on leaving Llangollen the river continues east, generally skirting the outcropping Karstic limestone exposures of Eglwyseg Rocks. Overlooking the river here is the medieval Castell Dinas Brân, a ruined fortress abandoned by John de Warenne, the river enters Wrexham County Borough, passing south of Trevor and under Thomas Telfords Pontcysyllte Aqueduct, of 1805, which carries the Llangollen Canal 120 feet overhead. Southern front of the north side of the first Marshalsea, 1773. The building with columns contained a courthouse. 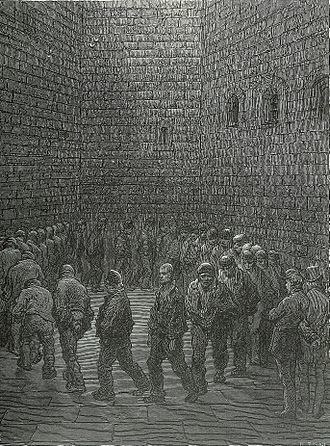 The door to the notorious strong room, where prisoners were held next to the prison sewer, is farthest on the right. 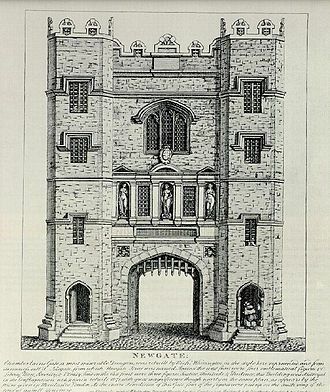 Christ Church as depicted in an 1845 edition of the Illustrated London News.